I believe that Rob Bell unnecessarily muddies the theological water and causes confusion. 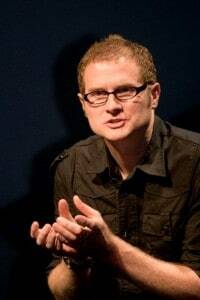 Everything I know about Rob Bell, I’ve learned from the few web clips I’ve seen in the last week or so. I would say that he is one who cares for people, is concerned about ministering to them and doesn’t want to offend (these are all positives). However, every strength used to excess becomes a weakness. To avoid confrontation when it is required, is no longer a positive. I want a doctor to care about me deeply, but I also want him to give me an accurate diagnosis and treatment regimen. He has to tell me the bad news for me to get better. This, I think is where Rob Bell fails, he doesn’t want to give the bad news for which we know The Cure. I think we should keep Mark 9:40 in mind “For the one who is not against us is for us” before we throw Rob Bell under the bus. We need to clearly teach what Scripture says about Heaven and Hell, pointing out where Rob deviates from Scripture, being careful not foment a personal attack on Rob Bell or apply labels to him. How do you attribute justice to God if there is no Hell? Do we really want to believe that Hitler, Stalin, Nero and Pol Pot are in Heaven given the lack of evidence that they ever repented? Choice always implies a consequence. Romans 1 tells us that at some point, God just lets people go in the direction that they want to go. Do we really think that people will shake their fist in the face of God in this life and then repent in the next? I’m OK with the idea that there will be surprises about who is in Heaven when we get there. The church has been too cavalier with applying litmus tests to faith over the years. I don’t know if you remember the “Lordship Salvation” discussion a while back. Some argued that you are not truly saved unless you acknowledge that Jesus is Lord of your life. Others argued that one could be saved and then move toward understanding that Jesus is Lord. Much of the discussion was theological nit picking and navel contemplation. We argue over the fine points of theology while people who don’t believe are dying without Jesus. So while I am frustrated by Rob Bell’s waffling on eternal punishment, I have to applaud his desire and efforts to bring people into the Kingdom of God. Rob Bell is accountable to God for what he teaches. Are there people who will go to Hell because they have false security as a result of Rob’s teaching? Perhaps, but I should be far more concerned about whether or not I’ve made the most of the opportunities God has given me. I have failed often and need to be tolerant of the failures of others. Am I off base on any of this? Please feel free to comment below.